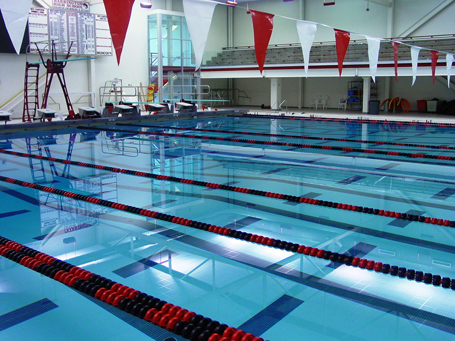 The Barrington School District commissioned Counsilman-Hunsaker, in association with Legat Architects, to replace their existing outdated pool with a new pool for the Barrington High School. Counsilman-Hunsaker was chosen due to a strong focus in educational facility aquatic design, and to help meet their aquatic programming needs and objectives. The new pool consists of a 25-yard by 25-meter competitive pool which includes one-meter and three-meter springboard diving. This is an excellent pool for lap swimming, recreational swimming, exercise classes, swim meets and other activities.